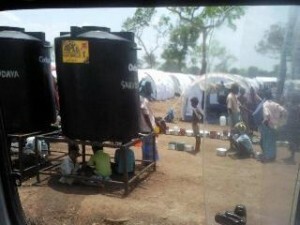 The camps were set up in January to house refugees from the war between the government military and the now-defunct LTTE. Some 300,000 people, including two Oblate priests, are being held in the camps with no freedom of movement. Few people, including NGOs, are able to get into the camps, and fewer still are allowed to leave. Families, separated by war, are unable to reunite. Thousands known to have or suspected of links with the LTTE have been removed, according to the government, for ‘rehabilitation’. Reports of torture and disappearance of suspected LTTE have been frequent.